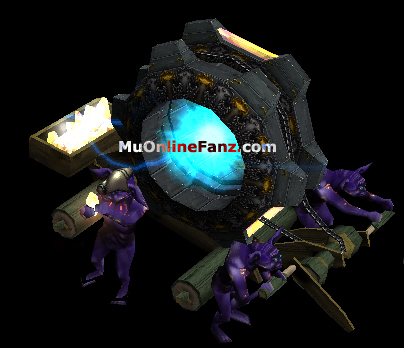 Chaos Goblin Machine <+> [MU Online Fanz] <+> Official 3rd-party [MU Online] Fan Site & Game Guide! NPC [Chaos Goblin Machine] and [Chaos Goblin] can be used for crafting items and upgrading equipment! Powered by the [Jewel of Chaos], the machine extracts the ancient source of energy from jewels to craft and combine items. [Talisman of Luck] increases crafting success rate. [Talisman of Chaos Assembly] protects some items from disappearing, if crafting were to fail. [Elemental Talisman of Luck] increases crafting success rate for [Pentagrams]. [Elemental Talisman of Chaos Assembly] protects [Pentagram] items from disappearing, if crafting were to fail. 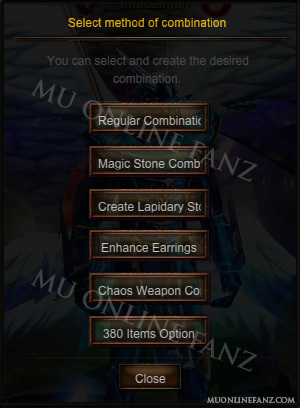 [Mass combination] allows some items to be crafted in multiple quantities by adding additional quantities of crafting ingredients. [Item Level] can be increased up to [+15] via NPC [Chaos Goblin Machine]! [Success Rates] increase by [+25%] if the [Equipment] is bound with [Luck Option]. [Equipment] [Item Level] increases by one level. The [Item Level] of any [Earring] can be increased up to [+15] via NPC [Chaos Goblin Machine]! [Earring] [Item Level] decreases by one [Item Level]. [Earring] [Item Level] resets to [+0]. [Earring] [Item Level] increases by one [Item Level]. [Magic Stones] can be crafted via NPC [Chaos Goblin Machine]! The [Required ingredients] list only mentions the minimum requirements for crafting. The combination CAN fail if the item is not valuable enough. Items of a high value will craft more [Magic Stones]. If any item is valuable enough to produce at least 1 (minumum) [Magic Stone], then there is a [100% Sucess Rate]! [Magic Stone] item is crafted. There is a [0% Success Rate]. There is a [100% Success Rate]. [Bound] [Tier 2] and [Bound] [Tier 3] [Wings]\[Cape] can be crafted with a [100%] [Success Rate]! [Bound] [Wings]\[Cape] are crafted using [Finished Loch Magic Solution], or [Finished Condor Magic Solution]. The unfinished [Loch Magic Solution] and [Condor Magic Solution] can be purchased via [NPC] [Priest James]. [Magic Solution] can become finished by aquiring [Magic Bubble]. [Loch Magic Bubble] is dropped by monsters between [Monster Level]  ~ . [Condor Magic Bubble] is dropped by monsters between [Monster Level]  ~ . In order to pick up [Magic Bubble], the corresponding [Magic Solution] must be in your character's [Inventory]. Place [Magic Bubble] into the [Magic Solution] in order to fill up the solution. Once the [Magic Solution] is filled 100%, it will turn into [Finished Magic Solution]. [Bound] items are nontradable, but can be store in the vault. All ingredient items are consumed. Several [Mounts] can be crafted via NPC [Chaos Goblin Machine]! [Horn of Fenrir] is also know as a "Red Fenrir." [Horn of Fenrir +Destruction] is also know as a "Black Fenrir." [Horn of Fenrir +Protection] is also know as a "Blue Fenrir." [+?% Success Rate] per [Magic Stone]. [Ancient] [Mastery Items] can be crafted via NPC [Chaos Goblin Machine]! The [Ancient] [Mastery Item], used in the combination, will upgrade into the next [Tier]. The crafted [Ancient] [Mastery Item] will be [Item Level] [+0]. The crafted [Ancient] [Mastery Item] will have [+Jewel of Life Option] removed. The base item upgrades, and all other ingredient items are consumed. Some [Ancient] [Mastery] items can be transformed to suit the needs of a different character build, of the same character class. Specifically, this function benefits [Fairy Elf] and [Magic Gladiator] character classes. [Mastery Item] [Ancient Set] will be transformed into a different type of [Ancient Set], of the same [Mastery Item] type. A [Conversion Order] item can be purchased via NPC [Priest James]. The [Item Level] and any options will not be changed. [Mastery] [Excellent] weapons can be crafted via NPC [Chaos Goblin Machine]! Transfered [Excellent Option], from item in combination. Transfered [Luck Option], from item in combination. Up to 3 random [Excellent Options]. [Excellent DMG Chance] is always bound. [Blessed Divine Archangel] weapons can be crafted via NPC [Chaos Goblin Machine]! [+FO] means the item possess all 6 [Excellent Options]. [Mini-game Tickets] allow entry to various [Mini-games]. These tickets can be crafted via NPC [Chaos Goblin Machine]! [Success Rates] increase by [+10%] when crafting in the [Event Square] map! Ingredient items must be the same [Item Level]. 1 [Mini-game Ticket] is created. The [Item Level] of the [Mini-game Ticket] transfers from the item used in the combination. [Potions] can be crafting via NPC [Chaos Goblin Machine]! 1 [Small SD Potion] is created. 1 [SD Potion] is created. 1 [Large SD Potion] is created. 10 [Potion of Blessing] is created. 10 [Potion of Soul] is created. There are several miscellaneous items that can be crafted via [Chaos Goblin Machine]! 1 item will be created. [Vicious], [Hyon], [Aegis], [Anubis], [Aruan], [Gywen], [Muren], [Broy], [Agnes], [Semeden], [Chrono], [Vega], [Chamer], [Akhir], [Carthy], or [Anas]. [+?% Success Rate] per [Higher Magic Stone]. [Chaos Weapons] can only be obtained by crafting via NPC [Chaos Goblin Machine]! All ingredient items are destroyed. [Guardian Items] can be upgraded with a [Jewel of Guardian Option] via NPC [Chaos Goblin Machine]! [Guardian Items] are also known as "[380 items]." [Guardian Item] will not downgrade. [Guardian Item] will obtain [Jewel of Guardian Option].